Regenerative medicines promises to be a (the) major technology driving the biopharma industry in coming decades. The CAR-T products are the first commercially significant products stemming from this technology, but they are just the tip of a very large iceberg. Novartis, Gilead and Celgene have gained first mover status in CAR-T drug development and are likely to dominate the regenerative medicine space in coming decades. However, in the near term of five to ten years, this is likely to be only one of several fundamental drivers of each company. In this near term time frame, one can’t invest in these companies solely on this basis. Worldwide there are 866 companies engaged in regenerative medicine research, most of which are small entrepreneurial companies. If history is any judge, it is these companies that will pioneer breakthrough products. However, most will lack the infrastructure and financial power to commercialize their products and likely will be acquired. Novartis, Gilead and Celgene are likely to be the most aggressive acquirers, but all of big pharma will be in the hunt. There will be great investment opportunities if investors can identify the companies likely to be acquired. One of the most novel ways to play the regenerative medicine tsunami is Cryoport. It has developed the dominant cryogenics logistics solution necessary for most products. Its dominant position is validated in that its solution is used by Novartis, Gilead and Celgene as well as many, many others. Cryoport’s destiny depends on the broad sweep of development, not just one product. It is one of my top recommendations. The CAR-T products Kymriah and Yescarta are in the very early stages of their US launch and were just approved in Europe. In the first six months of marketing in the US, Kymriah had sales of $28 million and I estimate that it was used to treat 86 r/r pediatric ALL patients. Yescarta had sales of $108 million and I estimate that it was used to treat 332 r/r DLBCL patients. I estimate that the annual addressable market in the US for pediatric r/r ALL is 900 patients and for r/r DLBCL is somewhat under 5,000. The European opportunity is comparable to the US. Celgene has projected that its two CAR-T drugs, the CD-19 targeted drug liso-cel (comparable to Kymriah and Yescarta) and bb2121 for multiple myeloma, will each achieve sales of $2 billion in 2030. Novartis and Gilead haven’t provided similar estimates for Kymriah and Yescarta, but state that each has blockbuster potential. In this report, I estimate that Cryoport receives about $1,800 per patient treated while Kymriah and Yescarta are priced at $325,000. This suggests that Cryoport revenues per $ 1billion of product sales is about $5.5 million. If Celgene is correct in its forecast, Cryoport revenues just from logistic support of liso-cel and bb2121 could be $22 million in 2030. Sales from Kymriah and Yescarta would add to this total and it is possible that Cryoport could add other services to increase revenues per patient. I think that there could be very important approvals for Kymriah and Yescarta in 2021 or 2022 in second line DLBCL that could expand the addressable market in the US from under 5,000 patients to 11,000. This is a huge opportunity. As important, Celgene is projecting that bb2121 could be approved in 2019 for treating multiple myeloma patients who have failed three or more rounds of treatment. The ultimate opportunity for CAR-T drugs in multiple myeloma is likely to be greater than in DLBCL. These should be modest catalysts for Novartis, Gilead and Celgene but very important catalysts for Cryoport. I think that most investors would agree that a (the) major technology that will drive the biotechnology industry for the next several decades is regenerative medicine; the use of living cells to treat disease. It will likely have a comparable or greater impact than recombinant DNA and monoclonal antibodies which have been the foundation technologies of biotechnology. The recently introduced and first important commercial application is engineering a patient’s own T cells to express chimeric antigen receptors that direct them to a cancer target; the acronym is CAR-T. Following close on the heels of CAR-T are new gene therapies in which an exogenous gene is transferred into the human genome to express a protein that treats disease. Spark’s Luxturna aimed at an inherited retinal disease that can lead to loss of vision is the first important such product to be approved. Gene therapy products to treat hemophilia and many other genetically caused diseases are in late stage development. CAR-T development was led by the two entrepreneurial biotechnology companies, Kite and Juno, and the big pharma company Novartis. Kite was acquired by Gilead and Juno by Celgene so that these companies and Novartis are the first movers and dominant companies in the CAR-T space. The big three are all in on CAR-T and are spending huge amounts of money and research resources on development and commercialization. Each company has predicted that their initial CAR-T products will become blockbusters. Of note, Celgene has predicted that each of its first two CAR-T products (one directed at the cancer marking antigen CD-19 for certain B-cell hematological cancers and the other at BCMA for multiple myeloma) each will reach $2 billion of sales by 2030. Both Novartis and Gilead have products targeted at these same antigens and represent that their products will also have blockbuster status, but haven’t issued precise sales guidance like Celgene. The two CAR-T targets (CD-19 and BCMA) are just the tip of a very big iceberg. In 2017, the Alliance for Regenerative Medicine estimates that globally there are 866 companies involved in this area: 486 in North America, 233 in Europe and Israel, 127 in Asia and 16 elsewhere. It further estimates that these companies are conducting 977 clinical trials- 93 in phase 3 clinical stage, 560 in phase 2 and 324 in phase 1. These are staggering numbers. How Can We Invest in Regenerative Medicine? Investors are obviously looking for the best investment angle to surf this regenerative medicine tsunami. I think that Novartis, Gilead and Celgene have established clear first mover status in the space and this strongly argues that they will be the dominant factors. They have the financial and technical resources to maintain their current leadership positions for decades. I think it will be extremely difficult for any of the other big pharma companies to catch up. However, as important as this technology is, I think that it will be only one of several drivers of their growth, at least for the next five to ten years. In that time period, one can’t base investments in these companies solely on this aspect of their business; it is just one of several key fundamental factors. I expect small entrepreneurial companies to continue to lead technological innovation as has long been the case in biotechnology. Willingness to take product development risk seems to be inversely proportional to the size of a company. However, most of small companies will lack the financial and infrastructure capabilities needed to commercialize their products. I see the investment opportunity as their being acquired by larger companies with Novartis, Gilead and Celgene being the logical and most aggressive acquirers. The acquisition of AveVix by Novartis in early 2018, which I discuss later in this report, is an example. There will be many, many other acquisitions of entrepreneurial regenerative medicine companies and identifying just a few or even one of them can lead to some outstanding investment returns. The best pure play in regenerative medicine that I have found is Cryoport which has a unique niche. In most cases, cells used in regenerative medicine therapies must be suspended at temperatures below minus 150° Celsius (minus 238° Fahrenheit) and maintained at that temperature as they are transported on a global basis between clinical and manufacturing sites, a process that can take several days. This presents both a technological challenge to create storage devices for shipping and then the logistical expertise to assure that the product being shipped does not change because of a temperature deviation between the time it is picked up and delivered. Cryoport has achieved a truly dominant leadership position in this area. The Company was initially formed to develop novel cryogenic shipping containers (dewars) and then evolved into creating a sophisticated and comprehensive logistics solution for their transportation. Logistical handling is an integral and absolutely crucial part of the clinical process needed to gain regulatory approval of regenerative therapies and is equally critical to maintain integrity of products after they are commercialized. Regulatory agencies will require data that shows that shipping of the product does not alter the characteristics of the product. This requires thorough documentation of what happens during the chain of custody and chain of condition. A temperature deviation can affect the efficacy of the products that are being shipped, which could therefore change the dynamics of a clinical trial or affect patient outcomes. The logistics methods used will be an integral part of the Biologic License Application (BLA). This is very important because once this is established, if the Company sponsor were to decide to change its logistics system, regulatory agencies almost s certainly would require evidence that the alternative way of shipping meets all of the data endpoints that Cryoport provides and thus doesn’t alter the therapy’s characteristics. This requires extensive work and possibly additional studies. Because of this, once Cryoport solutions are successfully incorporated into the clinical trial process, it will likely continue to be used as products go commercial and throughout the life cycle of the product with minimal chance of losing the business to a competitor or an in-house solution. The uniqueness and value of the Cryoport logistics solution and its dominant market position is unquestionable as Novartis, Gilead and Celgene are all using Cryoport in the clinical development and commercialization of their CAR-T products. As other companies decide on their cryogenic logistics strategy, there will be an extremely strong incentive to go along with the industry leaders in selecting Cryoport. The numbers appear to bear this out as Cryoport is supporting the two commercially approved CAR-T products Kymriah and Yescarta and 236 clinical trials worldwide: 31of these are in phase 3, 105 in phase 2 and 100 in phase 1. The stock of Cryoport has had a tremendous run up over the last year and in recent weeks has come off its highs. It is really difficult in an emerging situation like Cryoport to accurately value the stock on a near term basis and the recent weakness has led some investors to ask if there is something wrong with the CAR-T investment outlook. Are initial sales disappointing and has the area been over-hyped? I think not. This report stems from listening to conference calls of Novartis, Gilead and Celgene. As I listened to their plans, I remained more convinced than ever that this is an indeed a technology tsunami and Cryoport is the best surfboard to ride it. What are the Early Results of the US Launches of Kymriah and Yescarta? In early 2018, Kymriah was first to the US market and was originally priced at $475,000 per patient for pediatric r/r ALL. Yescarta then entered the market priced at $375,000 per r/r DLBCL patient. My sources suggest that after discounts and rebates the realized price for both products now is about $325,000. From this information, as shown in the following table, we can estimate the number of patients treated in 1H, 2018. By dividing revenues Cryoport has received from these products by patients treated, we can then calculate that Cryoport realized about $1,800 per patient treated. I would caution that because of the small number of patients treated that this number could change meaningfully in the future. However, this suggests that Cryoport will realize about $1,800 per patient treated and $1.8 million per every 1000 patients treated. The addressable market for pediatric r/r ALL is 900 patients in the US or about $1.6 million for Cryoport and for r/r DLBCL the addressable market is 5,000 or less suggesting $9 million in the US. The guidance given by Cryoport is that revenues from marketed products in each indication could range from $2 to $20 million. Remember that the number projected in the preceding paragraph are only for the US. As a rule of thumb, European potential is usually equivalent to the US. There may also be meaningful potential in the rest of the world. The intent of this report is to give investors a sense of the impressive efforts underway in regenerative medicine product development at Novartis, Gilead and Celgene. This is not to say that they are the only companies with important product development efforts. It is overwhelming and beyond my ability to try to capture everything going on so as a start, I am focusing on the big three. I have organized the report by reporting highlights of several recent conference calls of Novartis, Gilead and Celgene to give the reader some insight into their commercial and product development efforts. What is the mechanism of action of the current, approved CAR-T products, Novartis’ Yescarta and Gilead’s Kymriah? These products attach to cells in the B-cell lineage (the process used by the immune system to create antibodies) that express the biological marker CD-19. They attack and kill cells that express CD-19. This mechanism of actions is much the same biological approach used by the monoclonal antibody Rituxan (it targets CD-20 on B-cells), which is one of the most successful drugs ever marketed. What types of cancers do CD-19 targeted T-cells address? The mechanism of action potentially could treat all non-Hodgkin’s B-cell lymphomas. Each year about 75,000 patients in the US are diagnosed with NHL and this represents about 4% of all cancers. About 70,000 are B-cell lymphomas that may respond to CD-19 targeted T-cells. CAR-T cells are also effective against acute lymphocytic leukemias (ALL). The annual incidence of ALL is about 6,000 patients in the US; about 3,500 are classified as pediatric ALL and 2,500 are adult ALL. These CD-19 targeted T-cells are not effective against solid tumors. What type of cancers are Kymriah and Yescarta currently approved for and what is their incidence? Kymriah has been approved and marketed in the US for relapsed, refractory pediatric acute lymphocytic leukemia (r/r ALL). Chemotherapy is extremely effective as first line treatment in pediatric ALL. Hence in the US, the addressable market is only 900 patients. Yescarta is approved for a type of NHL called diffuse large B-cell lymphoma in patients who have relapsed from or are refractory to chemotherapy (r/r DLBCL). There are about 28,000 cases of DLBCL annually in the US. Initial treatment with chemotherapy is virtually curative in 60% of cases. The 11,000 who fail chemotherapy have a poor prognosis and are given another round of chemotherapy with the goal of achieving a remission that will allow a stem cell transplant. Those who fail second line therapy for which results are generally poor are referred to as relapsed, refractory DLBCL patients (r/r DLBCL). There are no good estimates that I have seen on the size of the r/r DLBCL market. My best guess is that this patient population is about 5,000. However, before being acquired, Kite estimated the size of the market at 8,000 occurrences per year. What is the status on approved indications in the US and Europe. Novartis’ Kymriah recently received approval for r/r DLBCL in the US and is in the launch phase in 2018. Remember that Gilead received US approval for r/r DLBCL and has launched Yescarta for this. Kymriah recently has received approval for r/r ALL and r/r DLBCL in Europe and Yescarta recently has received approval for r/r DLBCL in Europe. Marketing has begun in 2H, 2018. Celgene expects to launch its comparable product, liso-cel, in the US in 2019. Kymriah is the only product approved for pediatric r/r ALL in the US and Europe. What is the market opportunity for r/r pediatric ALL and r/r DLBCL in Europe? It is hard to come up with precise estimates given the number of diverse markets. Generally, investors estimate that the incidence of these disease in US and Europe are comparable. What is the Size of the Addressable Markets for pediatric r/r ALL and r/r DLBCL in the US? Using my estimates for price and the patient size of the pediatric r/r ALL and r/r DLBCL markets, I estimate that the addressable markets in the US are $293 million $5.6 billion respectively. The penetration of these addressable markets is still harder to estimate. CAR-T therapy is only effective in 30% to 40% of patient and physicians at this point can’t identify those patients moist likely to respond. There is also scant data on their duration of effect and overall survival as these drugs were approved based on small trial sand using objective response rate as the end point. CAR-T therapy carries severe, sometimes life threatening side effects and these are very sick patients and many will not be an able to endure the severe side effects of CAR-T therapy. Are there any new potential indications for CAR-T treatments in the next year or two? There are two very significant opportunities likely in 2019 or 2020. Novartis, Gilead and Celgene are in late stage development to use CAR-T therapy earlier in the treatment of DLBCL, moving from r/r DLBCL to second line treatment after first line chemotherapy fails. I estimate there are 11,000 second line patients annually in the US who are now treated with a second round of chemotherapy with the goal of causing a remission that would allow a stem cell transplant. Approval in this indication could lead to a dramatic jump in sales. Celgene expects approval of bb2121, its BCMA targeted product, in 2019 for multiple myeloma patients who have failed three prior rounds of treatment. Over time as this product and comparable products from Novartis and Gilead move into earlier lines of multiple myeloma treatment, the opportunity could be as big as DLBCL. Gilead in prior conference calls described in some detail the complicated logistics involved in the launch of Yescarta. This process starts with certifying centers. It is a challenge to get these centers up and running as they had limited or no experience in the complex procedure involved in administering CAR-T cells. They now have 16 centers that have been certified and are able to prescribe Yescarta. Within these centers they are entering a period of rapid expansion in their ability to handle more patients. They are also working hard on gaining reimbursement from private payors and CMS (Medicare) and making it easier for providers to obtain reimbursement. Data sets are emerging that will help in reimbursement discussions. As an example, they will soon have two year data from ZUMA-1 describing the duration of response of Yescarta. Management emphasizes the importance of the ZUMA-7 study in second line diffuse large B cell. Yescarta is currently approved in relapsed or refractory DLBCL in which patient have failed or relapsed after first and second line chemotherapy treatment. This is a large phase 3 global study which will complete enrollment by the end of 2019. Currently, second line DLBCL patients are retreated with chemotherapy and many move on to stem cell transplants. From a commercial standpoint this is huge as I estimate that the addressable market for Yescarta with the current label is under 5,000 patients in the US. Success in ZUMA-7 would increase the addressable market to perhaps 11,000. Gilead will also have data sets reading out in the treatment of mantle cell lymphoma and transformed indolent, non-Hodgkin’s lymphoma by year end. They are also completing a study combining Yescarta with a PDL-1 antibody this year. They are starting studies in pediatric and adult ALL. All of these studies are in phase 1 dose escalation studies right now. They hope to have data by the end of the year that will allow making a decision on phase 2 trials. Sales of Yescarta were $68 million in 2Q, 2018 which compares to $40 million in 1Q, 2018. They have completed the authorization to treat with CAR-T in more than 60 cancer centers. These cover approximately 80% of the Yescarta-eligible patients in the United States. While they continue to work on authorizing additional centers, the main focus is to work with centers to enhance patient flows. One key part of the strategy is educating community oncologists about cell therapy and how they can connect their patients to authorized cancer centers for appropriate treatment. It is still extremely early in the launch. In terms of access in the United States, the payer mix has been consistent with Gilead’s expectations. The majority of patients treated with Yescarta have been covered by commercial insurance or treated at PPS-exempt centers. They continue to work to provide better access for patients on Medicare. They have provided comments to the Centers for Medicare & Medicaid Services as part of the fiscal year 2019 rule-making process to create a DRG code that is reflective of the value that cell therapy provides to patients. This should be effective for the fiscal year beginning October 2018. Recently, the CHMP adopted a positive opinion on the Marketing Authorization Application for Yescarta in the EU, as a treatment for adults with relapsed or refractory diffuse large B lymphoma (r/r DLBCL) and primary large B-cell lymphoma (r/r PMBCL) following failure of two or more lines of chemotherapy. They expect the European Commission to grant Marketing Authorization in the third quarter of 2018 and preparations for launch are underway. They plan to complete the authorization of more than 20 centers in the EU by the end of 2018 with the initial launch efforts primarily focused on Germany and France. Gilead is particularly enthusiastic about ZUMA-7, the ongoing phase 3 study comparing Yescarta to the standard of care in second-line treatment of patients with diffuse large B-cell lymphoma. The current standard of care for these patients is salvage chemotherapy sometimes followed by an autologous stem cell transplant. If successful, this study would support the use of Yescarta in earlier lines of therapy and could spare people from having to undergo stem cell transplantation with all of its concomitant or attendant difficulties and complications. In the ten months since Gilead acquired Kite, they have initiated seven acquisitions, investments or partnerships that augment efforts to more rapidly bring forth cellular therapy, treat a broader range of hematological malignancies and also solid tumors. They recently announced a strategic collaboration with Gadeta, a privately-held company that focuses on the discovery and development of novel cancer immunotherapies based on gamma delta T cell receptors. Gilead is pleased with the progress of the Yescarta launch. They characterize it as a nice, slow and steady launch. It is tracking very well relative to expectations. The commercial patient experience with the drug has been generally consistent with those of the ZUMA-1 registrational study. Unlike Novartis, they are not having meaningful manufacturing specification issues. Gilead pointed out that they only charge a patient if they receive cells. So if something happens in the period of cell preparation, for example, the patient dies, then there is no charge to the family. Management emphasized that one of the most significant growth opportunities for Yescarta is moving into second line DLBCL Zuma-7 is a very exciting study. It is a head-to-head study of Yescarta versus standard-of-care. These patients have relapsed after initial chemotherapy. They usually repeat chemotherapy with the aim of achieving a remission or response that will allow them to go onto stem cell transplant. The study is comparing the standard-of-care chemotherapy pathway with early use of Yescarta CAR-T therapy. This is the first randomized phase 3 trial in the CAR-T field. The trials leading to approval of Yescarta and Kymriah in r/r ALL and r/r DLBCL have been small 30 to 100 patient trials with no control arm. It is a global trial that will enroll over 350 patients. The trial is enrolling rapidly and could complete enrollment by the end of 2019. The primary endpoint is event free survival and this endpoint is estimated to be reached in January 2021 according to ClinTirals.gov. The prognosis for patients who fail first line chemotherapy is poor and they go on to second line chemotherapy with the goal of achieving a remission that will allow for a stem cell transplant. The troublesome issues with stem cell transplant of graft rejection, apoptosis and recurrence make stem cell transplant a difficult therapy. Gilead believes that if ZUMA-7 is successful, this could be a great step forward for patients. There are also trials going on in other disease states such as mantle cell lymphoma, chronic lymphocytic leukemia and transformed, indolent non-Hodgkin's lymphoma. Phase 1b studies in each will have completed enrollment by the end of this year and will determine how and if to proceed toward registration trials. They will also be starting phase 2 studies in pediatric and adult ALL. Investors are asking when we could we see the mantle cell and indolent NHL data this year? The Company wouldn’t comment on the possible timing of data release although it will certainly be in late 2018 or 2019. On the CAR-T product targeting BCMA in multiple myeloma, there could be some data later in 2018. Management acknowledges that Celgene and bluebird bio are likely to be first to market and that the myeloma field is crowded with many effective treatments. Still, with Yescarta they will continue to strengthen clinical development and commercial execution that should extend to multiple myeloma. Their BCMA product is a single chain variable fragment, humanized that should minimize antigenicity. In animal models, they see an effect of the product in low BCMA expression. They will see phase 1 data later this year. They also have a backup product. Kymriah had Q2, 2018 sales of $16 million which compares to $12 million in 1Q, 2018, all of which were from treating relapsed/ refractory, pediatric ALL in the US. Kymriah just received FDA approval in r/r DLBCL and is introducing Kymriah for this larger indication that Yescarta was approved for in January 2018. It also recently received positive opinions in Europe from CHMP in both r/r pediatric ALL and r/r DLBCL. The launch for these indications is underway. Novartis says it is early days in what it anticipates will be a five-year journey to make Kymriah a globally successful brand. This is a very complex procedure that requires sophisticated physicians and facilities to administer CAR-T cells. Such capabilities are currently found primarily in major medical centers in the developed world. However, Novartis plans to ultimately build a worldwide infrastructure provide treatment to patients around the world. They have seen some issues with the percentage of cells that are viable after manufacturing. Management says that the commercial label specifications approved by the FDA are somewhat more stringent than what was seen in clinical trials. As a result, some of the patient cell preparations are at levels used in clinical trials, but less than the commercial specification. They state that it is more of a specification issue than a product variability/ efficacy issue. They are working with the FDA to try to resolve the situation. They say that the variability primarily affects cell preparations for r/r DLBCL and not pediatric r/r ALL. They want to make sure that as they ramp up in r/r DLBCL, the manufacturing issue will not impair their ability to meet demand. Management says that it is important for investors to understand that the variability that is being seen in the commercial specifications isn’t unusual with a new therapy. Even with this issue, they emphasize that they have been able to deliver final product to the majority of r/r DLBCL patients. Investors are asking if the manufacturing issues with Kymriah will affect clinical trials in second line DLBCL and other hematology indications or trials in BCMA targeted CAR-T therapy in multiple myeloma. Management doesn’t expect any effect. Celgene’s liso cel (aka JCAR-017) was acquired in the Juno acquisition; it is a comparable product to Yescarta and Kymriah that is also targeted at B-cell hematological cancers expressing the CD-19 antigen. Clinical data so far has led to the FDA designating it as breakthrough therapy that paves the way for accelerated review and approval. Celgene recently presented data from phase 1 studies of liso-cel in which there were 102 r/r DLBCL patients evaluable for safety. The incidence of cytokine release syndrome and neurotoxicity appeared to be less than that seen with Yescarta and Kymriah according to Celgene. Also, in 37 patients treated with the dose used in the registrational TRANSCEND trial, the complete response rate of 46% was better than that seen with Yescarta and Kymriah. Celgene says that liso-cel has better efficacy and safety than Yescarta and Kymriah. However, I believe the numbers of patients treated is far too small to confidently draw such conclusions. Celgene has an enormous development effort underway that is investigating multiple ways of targeting the B cell maturation antigen (BCMA) that appears on multiple myeloma cells. Celgene is the dominant factor in multiple myeloma drug treatment and intends to maintain this position. CAR-T is part of a strategy that also includes monoclonal antibodies, drug conjugates and combinations of all of the above. bb2121 is the lead CAR-T product which Celgene is developing it in partnership with the drug’s developer bluebird bio. CRB 410 was the first clinical trial of bb2121; it was a dose ranging study that initially enrolled 21 patients and added a second cohort of 29 patients. Data presented in May 2018 at ASCO showed an encouraging safety profile, notable for the low rates of severe cytokine release syndrome and grade 3-4 neurotoxicity. Celgene has begun the potentially registrational trial of bb2121 called KarMMa, which will enroll 80 patients in an open label trial. It will enroll very advanced patients who have failed three or more prior lines of therapy. Celgene has said that bb2121 is on track for a 2020 approval. Celgene is also planning a phase 3 trial in the third line myeloma setting. The Company says that as drugs are moved earlier up in the treatment sequence that the small open label trials with objective response rate as an end point will not be acceptable. The trials will need to be randomized with endpoints focused on durability of response and long-term outcomes like progression-free survival and overall survival. Celgene is also investigating two backup drugs to bb2121. One is a follow-up from bluebird bio called bb21217 and the other is a Juno drug, JCARH125. Novartis and Gilead are both developing BCMA targeted products. 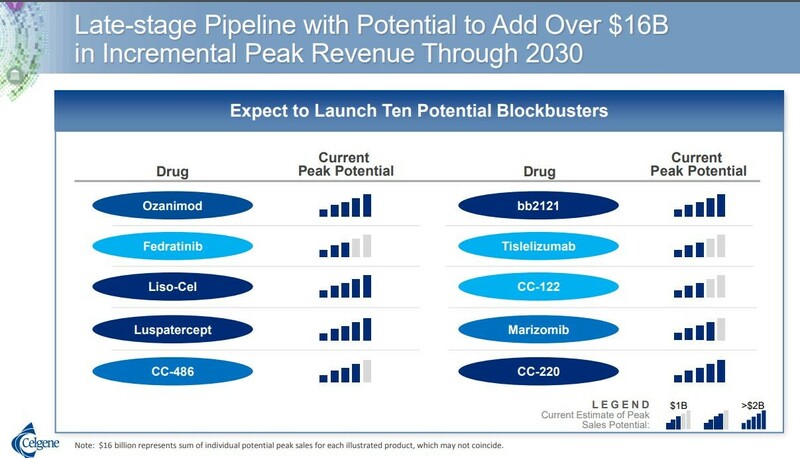 In their second quarter conference, Celgene presented a slide that estimated potential revenues for their pipeline sales in 2030. They indicated that they believed that both liso cel and bb 2121 could have sales of over $2 billion in that year. In the following table, the number of shaded bars conveys the sales opportunity perceived by Celgene. Both liso-cel and bb2121 have the maximum five bars resulting in a 2030 sales projection of $2 billion. In April, 2018 Novartis announced an agreement to acquire AveXis, in order to expand its platform in gene therapy. It has also licensed Luxturna from Spark Therapeutics. They have a strategy to be one of the major players in cell based and there will be more acquisitions.in the future. Type 1 patients develop symptoms six months after birth. The prevalence in the US is 3,300 such patients and 90% are dead at two years. Type 2 patients experience symptoms at six to twelve months after birth. The prevalence is 12,000 patients in the US and 32% die before they are 25. Type 3 patients experience symptoms in childhood or early adult hood. They lose the ability to walk independently and may lose the ability to walk over time. The prevalence is 8,200 and these patients have a normal life expectancy. Type 4 patients experience symptoms in early adulthood. Initially they can standalone and walk, but over time may lose the ability to walk. They have a normal life expectancy. The prevalence is not known. The initial clinical trial of CLL-101 was in Type 1 and symptomatic Type 2 patients. This addresses the 3,300 Type 1 patients and probably a good number of the Type 2 patients. To put this in perspective the addressable market for r/r pediatric ALL is 900 in the US and for r/r DLBCL it is about 5,000. This is a larger opportunity than the market currently addressed by the approved indication of Yescarta and Kymriah. Other trials underway are aimed at demonstrating efficacy in all 23,500 patients with Type 1, 2 and 3 SMA in the US. The BLA submission in the US will be before the end of 2018 and in Europe in 2H, 2019. Novartis is anticipating approval in 2019. AVXA-301 SOD1 is in pre-clinical for ALS SOS1.